Americlock creates large traditional and modern clocks ranging from 3’ to 50’ in diameter. Building large custom clocks with your design or ours is our specialty! As experts in the creation and manufacturing of unique time pieces, we offer a variety of different large clock types for various installations: bracket clocks, canister clocks, cell tower clocks, cupola clocks, floral clocks, marker clocks, monumental clocks, skeleton clocks, tower clocks, and wall clocks. We design and fabricate these large time pieces based on your custom requirements to fit your specific application whether it be 10 or 100 feet off the ground. For traditional faces, Americlock can provide classic dials to fit your building needs and for large custom clock designs, we can work with you or your architect to build the perfect clock. With our custom clock dial design system, you can choose from a wide selection of dials, hands, and numerals as well as marker-only options (which enable you to install your clock directly on substrates such as brick, concrete, or wood). With complete design/build solutions, our large clocks can be built to adhere to almost any facade or tower (even if a traditional large wall clock is out of the question). 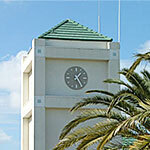 Our large custom clocks can be seen throughout the United States and on every continent except Antarctica. You can find our installations in shopping malls, retail outlets, universities, colleges, government buildings, state offices, corporate headquarters, office buildings, personal residences, schools, chapels, basilicas, churches, and more. Americlock’s fabrication services offer you optional on-site installation or installation consulting services almost anywhere in the world. Our qualified technicians can program you with controllers to automatically adjust clocks for daylight savings time and power loss events to minimize the need for manual intervention. For a complete set of options, more application-specific photos, and additional information about our large custom clock services, select a link to the left. If you don’t see the design that you are looking for or if you have a different dial design in mind, contact us and our team can assist you with building the right clock for your project.